definitely pine -- i know what it looks like e/b 7-9 am leaving flushing and 4-7 pm w/b leaving great neck. how would u feel if the queens/nassau overlapping lines were merged into one and the nassau buses carried local in queens and several q12/q5/q43 runs etc.etc. were eliminated and instead the n21, n4, n22 etc ran better headways including 24hrs to glen cove, mineola, and freeport? how would u feel if the n22 ran to mineola at least 24 hours but there were no more q43s at nite and n22s carried local all day except maybe some rush hour svce? I know this is a stale thread, but here is a related photo from June, 2017. N20 was split at the Great Neck LIRR station, as someone on the thread long ago suggested. 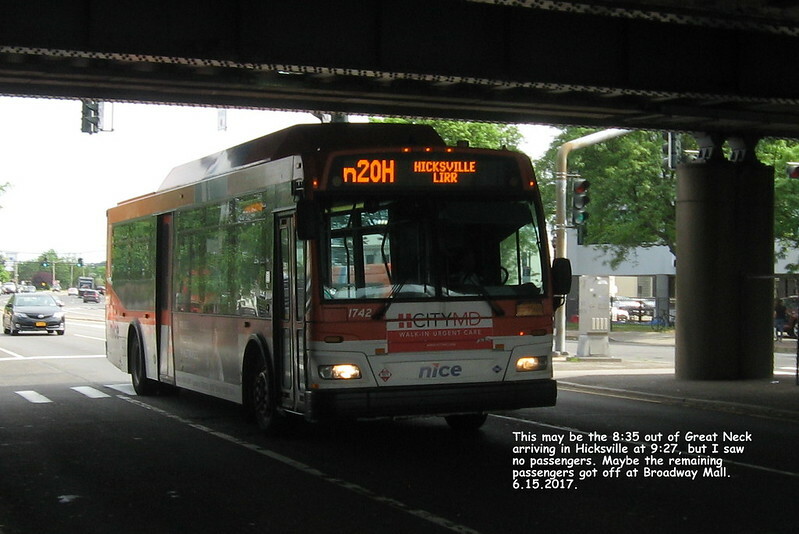 Here is an n20H arriving in Hicksville the other day.